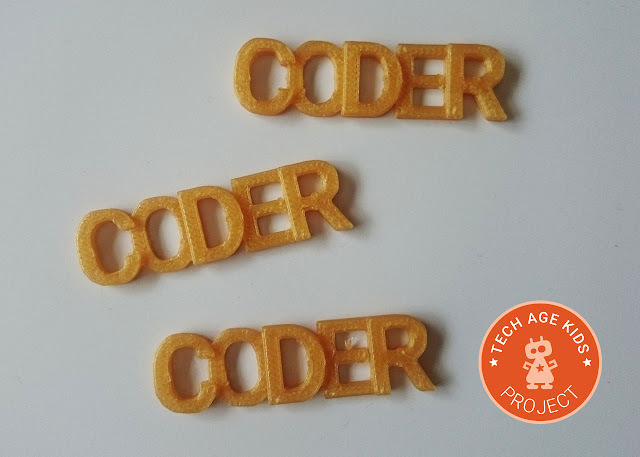 We've been making 3D printed "CODER" badges by coding the badge using BlocksCAD. This makes a great first introduction to modelling for 3D printing for children. I've been exploring different tools for children to use to create 3D models and I've found that coding works really well. This project uses 3D text and the ability to translate the position of objects and union (join) them together into a single object. We've used the text "CODER" so you can give them as small rewards for coding. You can glue a badge pin onto the back of the badge or pop a keyring loop through the letter "C". Once children have created the example they can change it to their own name or something they like. Click Here to download step-by-step instructions that introduce the concepts gradually.